Mina and Celeste will soon be immortalized on canvas. Actually, Mina already is! I first learned about Sheila Tajima when she emailed me at work - she wanted to paint pictures of some of the animals and then auction them off to benefit the sanctuary. When I saw her paintings, I fell in love. They are colorful yet soft and capture the personality of the subject beautifully. I've always wanted to paint but found photography to be my preferred medium. That Sheila used my photos to create the artwork was an honor and compliment (it meant I could sort of pretend I had a hand in the painting, heh). When I asked about doing a commission, to paint my two beloved dogs, she was more than happy to help out. Mina is there. Right there. If you see a sensitive soul, then you are seeing Mina. If you see a dog with an edge of angst, you are seeing Mina. If you see a beautiful, wondrously amazing animal - no duh, you are seeing Mina. I'm really fond of the result. I didn't realize that this would end up being a difficult paint job for Sheila. As I commented to her - Mina is a challenging dog, so it seems fitting she'd be a challenge to paint in just the right pose with the right colors and that perfectly pensive expression on the right face. 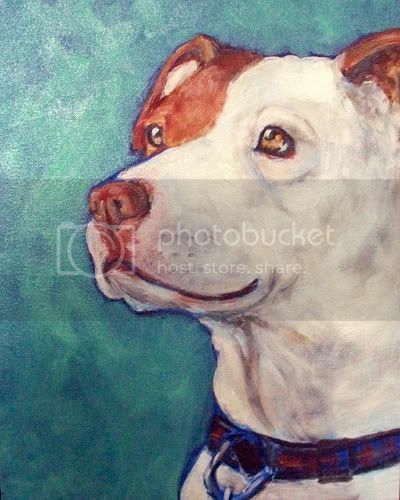 She does pet portraits and you can see her etsy shop here. I can't wait to see Celeste - she gets colors! Crazy ones, I hope, to best represent her out-there personality! wow! she did a fabulous job! That is a beautiful painting! She did a great job! WOW!! THAT IS awesomely cool. sorry for capslocking at you.